If you are looking for creative and beautiful jewelry from an up and coming designer then don't look much further. Jonelle Maira is a jewelry designer from Rochester, NY who first started selling her jewelry under Poison Apple back in 2003. She has now relaunched her 19070s inspired with a Southwest Navajo twist jewelry line under her name Jonelle Maria. 1. Where are you from? I'm from Rochester, NY. A city way upstate an hour and a half away from Toronto, Canada. Although, I Spent the better part of the last decade living in NYC and plan to move back there. 4. Where do you find most of your inspiration? Each time I create a collection I take into consideration what the current trends are and I work with the silhouettes of what's currently trendy and then I incorporate whatever is currently inspiring me in terms of materials, colors, patterns etc. My latest pieces have been inspired by the southwest, the 70's, navajo and aztec prints and geometry. Inspiration can come from anywhere though, a magazine, a blog, a great jewelry part that i've sourced, a dream, a thought....etc. Each of her pieces is more creative and beautiful then the next. She also has a few Web Exclusives (which means once their gone their gone) so make sure to check out her Web Exclusive page to see what limited edition pieces of jewelry she has. I mean come on everyone wants a one of a kind piece of jewelry! 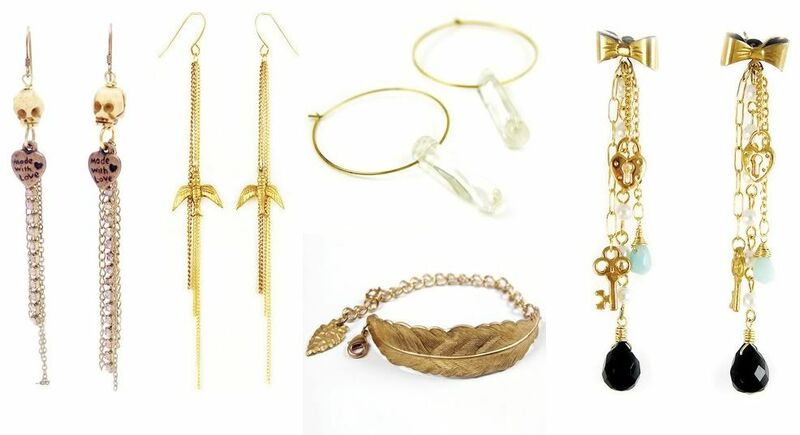 those earrings are really lovely, I like the dangly one with the bows and the lock the most!